Most people don’t think about their roof until something goes wrong, but it’s important to have a roofing contractor inspect your roof yearly (or after a major storm) to prevent big issues from cropping up later. 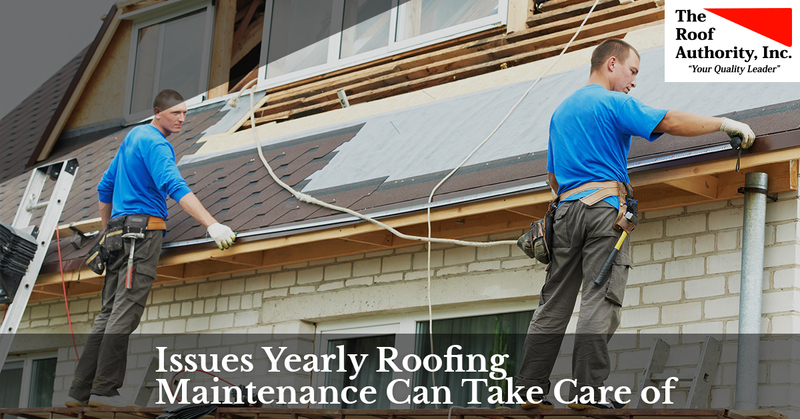 You will save on the cost of roof repair or total replacement when you keep up on service. At The Roof Authority, we’ve been in business since 1993 and are dedicated to serving the Fort Pierce, Vero Beach, and surrounding areas. When you need a roofing contractor to repair a leaking roof, perform maintenance, or install a new roof altogether, give us a call and we will provide you with a free estimate. Contact us today! Here are some of the things a roofing contractor can check for that might not be apparent to the untrained eye. You see your home every day, and probably won’t notice the gradual process of aging and becoming weathered. What you consider normal might not be at all, and an experienced roofer will know what to look for. The sun beats the roof with UV rays and heat, which will not only cause fading, but cause cracking, peeling, and other damage. If you’re in a windy area, the debris the wind blows with it will slowly wear down the shingles and paint. Age, storms, and other factors can cause cracks and other types of damage that will allow the elements to enter your home. You might not even notice this until it’s past the point of being a minor repair. Water can slowly work its way into your roof, eaves, attic floor, and the rest of your home, and be disguised by paint, wallpaper, and carpeting. The damage will become apparent when you get a bigger leak or a dark ring forms on your ceiling or walls. We love green roofing, and are experts in green roofing installations. However, when grass and other plants randomly start growing between your shingles that is not a good thing at all. Seeds can be blown up high by the wind, and in a humid climate like we live in, it’s not hard for them to begin to germinate. The roots can burrow into the wood, and you’re in serious trouble. Have your energy bills begun to rise? If so, your roof might be the culprit. Small cracks in your roof can allow air to escape, and your HVAC system has to work full force to keep up with the demand. You’re wasting a lot of money this way, and when you consider the cost to repair a leaking roof, you’re making a good call doing this preventative maintenance. You might not be able to see damage from the inside of your home, but your skylights could be in need of some TLC. The sun, wind, hail, and other forces can cause issues that aren’t easily apparent. Your roofing contractor can inspect the skylight for issues and do some repairs or a replacement to keep things running smoothly throughout the year. The Roof Authority proudly serves Fort Pierce and the surrounding areas. When you need an experienced roofing contractor, give us a call and we will get you a free quote!